Please refer to our stock # TC239 when inquiring. 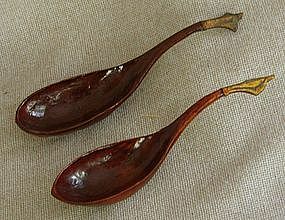 This antique pair of wooden spoons were hand carved and delicately shaped. The handles are deeply arched and the ends are painted with a gilded paint. They were heavily covered with a clear lacquer finish.